As the title suggests, I have indeed been feeling rather stuck in a rut when it comes to most dealing with life type things for a good few months, and have been growing increasingly frustrated with the situation. This has not, unfortunately, been particularly conducive to getting back into the swing of things with working with the cards. This afternoon I decided to try to kill two birds with one stone and ease myself back into more regular tarot reading/blogging by pulling a few cards from my all-time favorite deck, the Nusantara tarot. It's funny how illuminating a simple two card draw can be. After looking at these for a few moments, I realized that what I have is both the a description of the crux of the issue, and a general guide to the solution. The World card, of course, represents accomplishment, self-improvement, fulfillment. It shows the unity of various aspects of the self, and celebrates what this can achieve. It is ostensibly the 'goal' towards which one strives, and in this context, it certainly represents a better head-space than the one I've been in of late. What's interesting here, however, is that here it appears first, the position suggesting foundation rather than endpoint. One the other hand, we have the Eight of Cups. The traditional RWS imagery of this card always brings to mind nostalgia for me. This card speaks of the things you walk away from, the things you might desperately miss but need nonetheless to leave behind. In the Thoth, this card is titled Indolence - that too fits, indicative of the consequences of not turning your back. The alternative of moving forward is to wallow... a self-indulgence whether it be laziness, self-pity or whatever else. 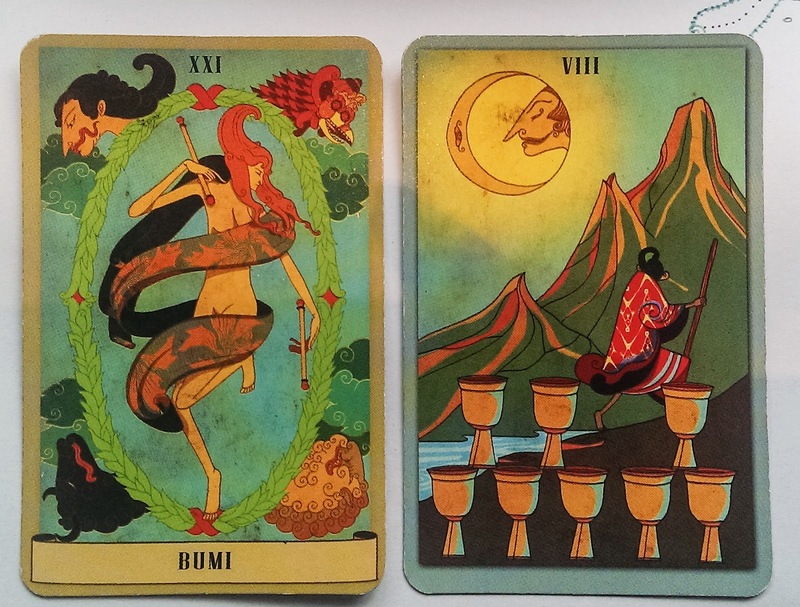 The card is not, however, all about the those cups the man walks away from - the point is also the mountains he is walking towards, the new path forward and toward the unknown. That image, following (rather than preceding) the World card, points to the crux of the message for me here, I think: that I need movement and forward momentum to thrive. Most of all, I need to feel that what I am doing serves some kind of purpose, brings me closer to achieving something, makes a difference to someone, improves the world around me, or equips me to better do those things in the future... something. Without that, regardless of whether what I am actually doing day to day is enjoyable, and regardless of whether the people around me are awesome and supportive... on a fundamental level I struggle with feeling unhappy and unmotivated. Without something external that is meaningful enough to set up life around everything just feels...endlessly pointless. Why bother trying and why bother writing and why even bother eating for that matter? It becomes a vicious cycle, deepening and perpetuating the rut, the negative thoughts, the weight of inaction. Given that...well. Since finishing my grad program, I haven't had that sense of working towards a goal and doing something I love the way I did with my studies. There is no structure to time and activity to guide me, no reading or discussion or learning with career in mind to inspire me. Instead there is job searching that becomes more discouraging and difficult to do the longer it goes on, and too much time wasted on meaningless if enjoyable in the moment pursuits. I need external responsibilities in order to have that sense of forward movement. Not sure how to remedy the situation in the short term, but it is the only solution that makes sense. I cannot just exist, just be - my brain equates that with being a waste of space, my mind becomes bored, and my more self-destructive tendencies strengthen. I had never heard of the Nusantra, I quite like it. Years ago I ordered the Tarot Wayang from Indonesia via Tarot Garden. It's hard when decks are published in far-off lands. Waiting times are always frustrating. I understand how the schedule and discipline of your graduate studies is missing, making you feel anchor-less. I find myself that learning with my cards fills a space well, particularly if I'm researching mythology or art history. I use a lot of postcards for that reason--mere exploration and something to grip the mind with. Some of my card studies become essay-like when something piques my interest. You might find something like that gives you a small window of relief.